The profile of Pic St-Loup has changed dramatically in the last twenty years. In the mid-1980s the co-operative of St. Mathieu-de-Treviers dominated the production of the area, but since then there has been an incredible surge of new producers, as newcomers have arrived in the area and land has changed hands or been withdrawn from the co-operative. Today Pic St-Loup is one of the most energetic crus of the sprawling Coteaux du Languedoc and is in the process of establishing its own independent appellation. This is dramatic countryside. 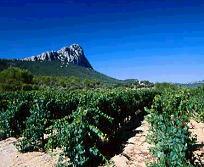 The Pic St-Loup is a pointed mountain rising to 638 metres, some 30 kilometres north of Montpellier. It dominates the surrounding countryside, sitting across the valley from the Montagne de l’Hortus, which gives its name to one of the area’s leading estates. Just 18 kilometres long and three kilometres wide, this compact area includes 13 villages, the most southern of which borders the suburbs of Montpelier. Land is more valuable for houses than vineyards. So what distinguishes the Pic St-Loup from the other crus of the Coteaux du Languedoc? Its producers suggest that it has a more northerly climate than the others. Average temperatures are cooler and rainfall a little higher.Wind protect the vines from the twin problems of rot and frost, and the soil is stony and poor, based on clay and limestone. Pic St-Loup differs from basic red Coteaux du Languedoc in that it demands a higher percentage of the so-called cépages améliorateurs or improving grape varieties, namely Syrah, Grenache Noir and Mourvèdre, which must account for 90 per cent of a blend. The yield is restricted to 50 hl/ha, which is modest for the Midi and the minimum alcohol level, without the possibility of chaptalisation is 11.5%, as opposed to 11% for simple Coteaux du Languedoc. Also the vines must be older, six years for Pic St-Loup, while three years is usually sufficient for most appellations. The younger vines therefore are used for rosé, Coteaux du Languedoc, or even vins de pays. Not all the vineyards have the required percentage of Syrah and there is still too much Carignan and Cinsaut, which again is used for Coteaux du Languedoc, or the local Vin de Pays du Val de Montferrand. There are several committed growers, illustrating the enormous potential of the area. Jean Orliac at Domaine de l’Hortus was one of the pioneers, helping to focus attention on its untapped potential. His vineyards are dramatically situated in the valley between the Pic St-Loup and the Montagne de l’Hortus. He first saw the site of his future vineyards while rock climbing as a student. Today he makes a Cuvée Classique and a Grande Cuvée in both red and white, though for the moment Pic St-Loup is red or pink, but cannot be white. He looks for elegance in his wine, and if the vintage allows it, some power. These are wines to age.Jean-Benoit Cavalier at Château de Lascaux is an articulate exponent of his appellation, and ardently convinced of its untapped potential. He took over the family estate from his grandfather in 1984 and withdrew the vineyards from the cooperative. Again he makes two white wines, with variations of Marsanne, Rolle and Viognier. His red, Pic St-Loup Cuvée Nobles Pierres is mainly Syrah with a drop of Grenache Noir, given eighteen months élèvage including a year in barriques and again combines elegance and concentration. Other estates are contributing to the growing reputation of the area. Christophe Peyrus at Clos Marie left the navy to take over running his wife’s family vineyards. For Rémy Duchemin at Mas de Mortiès, winemaking also represents a career and life style change, for he used to produce video films in Paris. Fabien Reboul at Château de Valflaunès worked in New Zealand and Oregon before returning to his roots to make his first vintage in 1998. Their wines are redolent of ripe fruit, with the scent of the herbs of garrigue, the scrubland covering the surrounding hillsides, conveying above all a sense of place, of the warm south. The future for this aspiring appellation looks rosy.